Captive Andromache, c. 1888 by Frederic, Lord Leighton. Published with the Manchester Art Gallery. Frederic, Lord Leighton (1830–1896), the acknowledged leader of the Victorian classical school of painting, was born in Scarborough, England. His childhood was largely spent traveling in Europe with his family, and he received his artistic training in Brussels, Paris, and Frankfurt. In 1858 Leighton settled in London, where he had a glittering career as a painter of historical and mythological scenes and was elected president of the Royal Academy in 1878. In 1896 he was ennobled—the only English artist to receive this honor. His full title was Baron Leighton of Stretton. 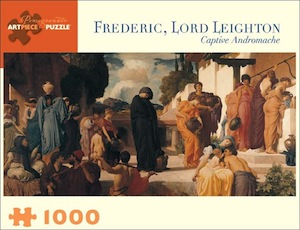 It took Leighton over a year to complete Captive Andromache, the painting depicted on this puzzle. Large-scale paintings of scenes from ancient history and legend brought prestige to both the artist and the purchaser. Thoughtfully conceived and engagingly intricate, our 1,000-piece interlocking jigsaw puzzles combine superb color reproduction, stunning and unusual images, and sturdy construction to delight generations of novice and veteran puzzle workers. Puzzle size: 32 x 16".